There’s a two word descriptive that adorns West Virginia license plates. It refers ostensibly to the natural beauty of the landscape, but is equally applicable to the finest golf course in the state. 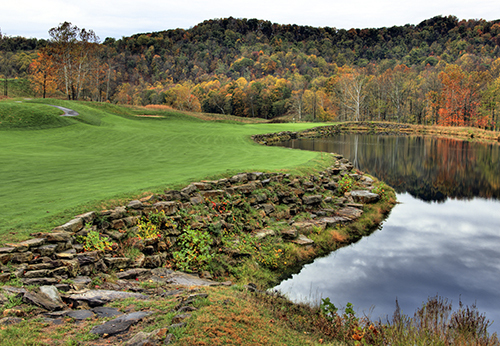 Because just like West Virginia itself, the Pete Dye Golf Club is also Wild, Wonderful. While a typical golf course can be built in a couple of years’ time, it took a full sixteen years—longer than it took to build the Brooklyn Bridge, about the same amount of time it took to construct the Taj Mahal--- to complete the Pete Dye Golf Club. The golf course sprawls over 275-plus acres on a 1,200-acre property that was originally un-reclaimed mine land. For those unfamiliar with the mining business, it’s hard to fathom how ghastly the property was before Dye began the decade-and-a-half restoration process. Picture Dante’s Nine Circles of Hell, but in this case the circles were gob piles, (which are smoldering slag heaps of coal) a strip mine pit (now a sparkling four-acre lake at the club’s entrance) coal waste, sulfur balls, carbonaceous matter, abandoned equipment, scattered mine posts, scraggly weeds and withered vegetation. 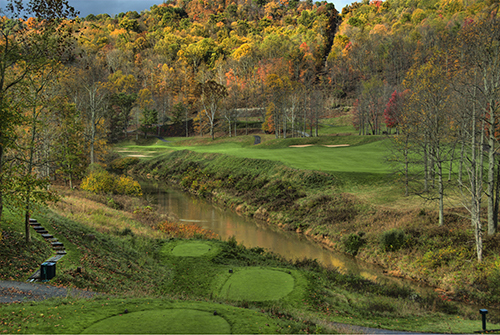 The laudatory turnaround from earthen abscess to dazzling golf course, this incredible refurbishment of abandoned mine land, is probably the main reason why the Pete Dye Golf Club is one of the master’s “must-see” creations, and truly one of his greatest achievements. Drama abounds throughout the acreage. There are waterways snaking throughout the property, plenty of elevation changes, split level fairways, ravines, and expansive waste bunkering. Though generous from the tee box, it’s an exacting course from an approach shot perspective, and exciting at every turn. The greens at the Pete Dye Golf Club mimic the drama of the surrounding landforms. They tilt and pitch in every direction, much like the fairways. This sensibility is at its apex on the dizzying 17th. Standard adjectives for undulation don’t suffice, so perhaps the best descriptive is “warped.” Which come to think of it, is a word that’s often been used by frustrated golfers to describe the architect’s sense of humor. As the years dragged on, cynical observers might have thought the prospects of ever completing the project were as tenuous as a canary in a coal mine. But slowly and surely, this dazzling course sprung from the landscape. “I will say that it’s eighteen of the most exciting and memorable holes that I have ever built on one course,” offers Dye. The coal car at the club’s entrance gate sets the tone, but there are other reminders of the property’s origins at every turn. There is a rotary car tipple and multiple attached coal cars adjacent to the tenth fairway. There is a pair of thousand-foot smokestacks used as a distant aiming point off the fifth tee, and a gargantuan ventilation return near the first green. 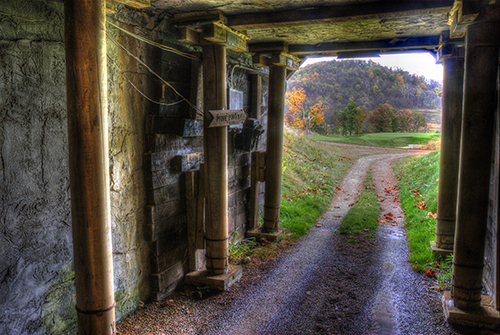 But the most distinctive manmade feature is the honest-to-goodness mine tunnel that connects the sixth green and seventh tee. Players go subterranean, moving through a dank channel, a gloomy reminder of the hardship and harsh reality of a miner’s life. Transitioning from bright sunlight into dim shadow, the temperature plummets noticeably while making the hundred-yard walk beneath the mountain. It is just one of the reasons why this stark homage to the coal industry, perfectly juxtaposed between stunning golf holes, is one of the coolest accoutrements in golf.